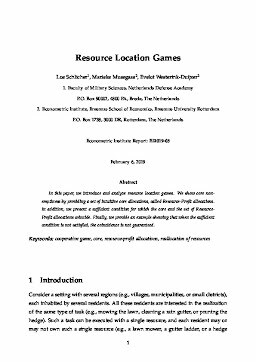 In this paper, we introduce and analyze resource location games. We show core nonemptiness by providing a set of intuitive core allocations, called Resource-Profit allocations. In addition, we present a sufficient condition for which the core and the set of Resource- Profit allocations coincide. Finally, we provide an example showing that when the sufficient condition is not satisfied, the coincidence is not guaranteed.